Refollow is yet another online Twitter app which allows you to manage your followers/friends. Like Tweepular, it allows you to bulk follow, unfollow and block user with two clicks and its very easy to use. It helps you filter your Twitter friends to find the ones that are following you, the ones you are following as well as the ones that are not following you and the ones you are not following. All this means that you can follow back users who are following you or drop users who don’t follow you back…especially if you think having mutual follow friendships is important. In any case, it can also allow you to enter another Twitter username and see which of their followers are following you and who you are following as well. But Refollow goes beyond just managing your own friends. You can easily see the users which are followed by any specific user. It’s an interesting way to find new people with similar interests. Instead of clicking around on many profiles, you can just enter in usernames and work from there to follow people they follow or follow their followers. Refollow uses Oauth, so you don’t need to give them your password, all you need to do is to sign in through twitter. It also uses the API which means there is a limit to the number of people you can follow or unfollow at once. The API limit can be seen at the bottom of the screen. 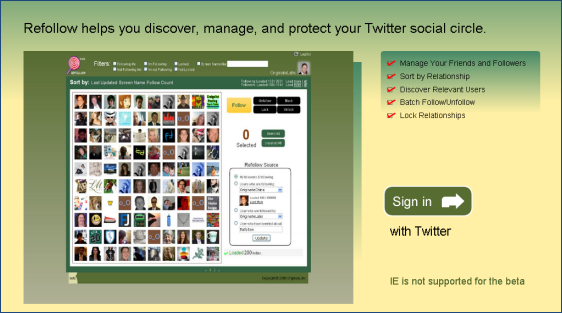 Most likely you will have to run this tool in batches if you want to manage/follow/unfollow a lot of users.